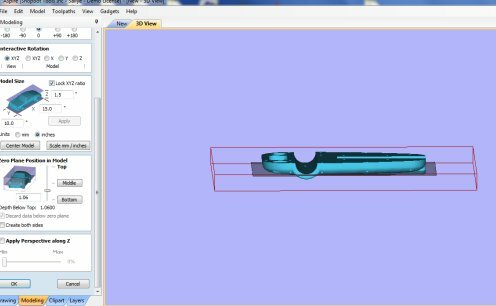 A good friend recently sent me a Solidworks file, and asked about machining it on a ShopBot. 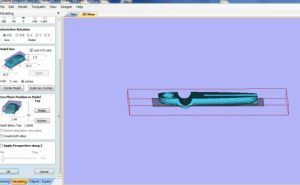 I don’t have Solidworks on my computer, so I requested and received the model as a “.stl” file. The model could have just as easily been created in Inventor, Rhino or any other 3D rendering software/scanner. 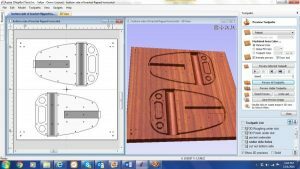 Since I do have Aspire CAD/CAM software (VCarve Pro’s big sister software), I imported the .stl (component or 3D model) twice (inside and outside) so I could plan my strategy. 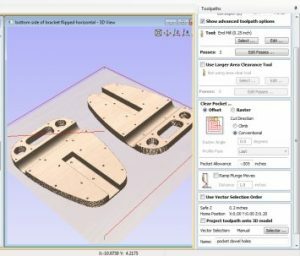 VCarve Pro (v. 8.0 and later) is fully capable of doing all the machining, but you can only import one component at a time. 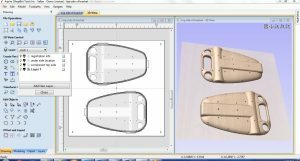 That would work for this application, since the “Inside” and “Outside” of this project need to be treated as separate CAD/CAM files. At the end of this entry, I have indicated how I would charge for a project such as this. 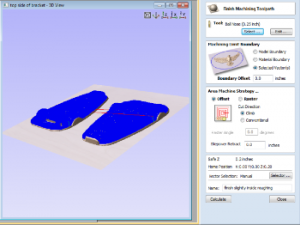 Use the tools under the Modeling tab to import the 3D model into the Vectric software. 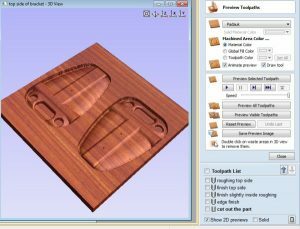 If using Aspire, import the .stl twice: once for the “Inside” and once for the “Outside”. If using VCarve, open up two sessions to import each side one at a time. Use the “slider bar” on the import page to determine where to slice each model to get all the details on each side. The total thickness of the model is 1.5″ but each side needs to be machined to a depth of 1.1″. 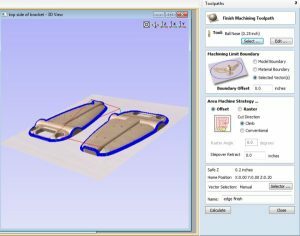 Since the midpoint of the material is only .75″ and each side goes deeper than that, it is best to treat the two sides as two different models. See HELP in Aspire/VCarve for terrific instructions on how to do this (this blog entry also gives a few more details). The project was going to require two-sided machining. 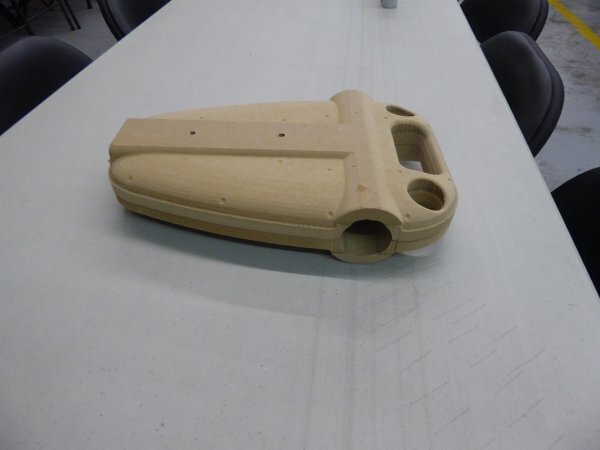 Two samples were needed to complete the large seat bracket (~15″ tall and 1.5″ thick per sample). The customer didn’t specify any requirement for material. The material needed to be exactly 1.5″ thick so that the inside and the outside of the sample would line up correctly. 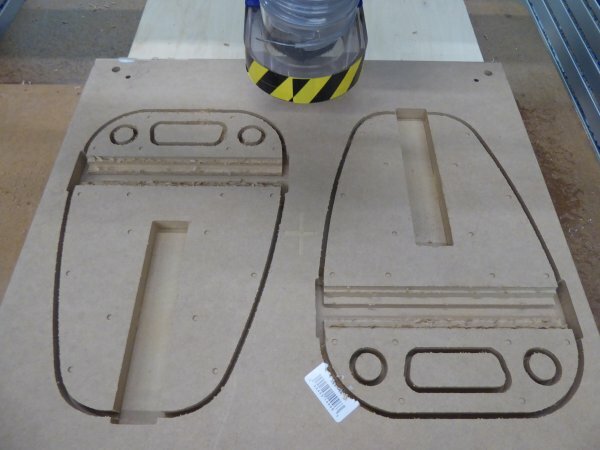 Letting the store cut a 2′ x 4′ x .75″ piece of MDF in half crosswise would save doing it at home. Gluing the two pieces together with wood glue and letting them dry would make up a board 1.5″ thick. Purchasing a dowel at the same time would help with the registration of the board for flipping. 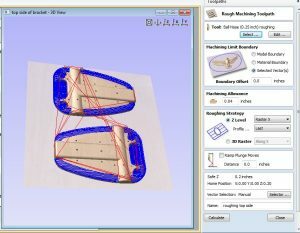 Set X, Y origin in the CAD file to the middle of the material. Set Z Zero to the top of the material. 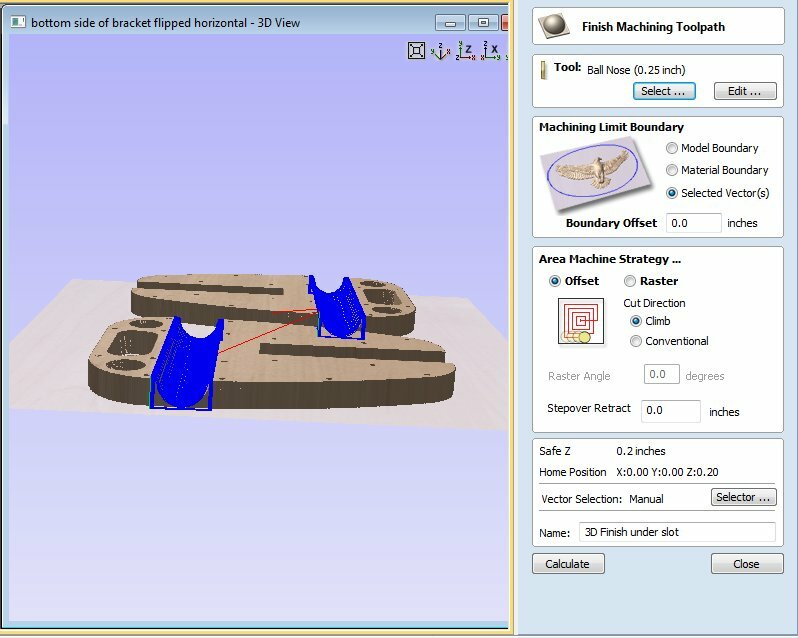 Decide how to flip the material (horizontal or vertical). Use 4 dowels as registration markers. Start with a temporary spoil board attached to the table, and machine the dowel holes and center point into the temporary spoil board. 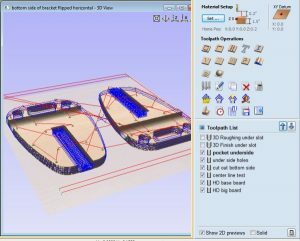 Indicate in the CAD file where to put hold down screws in the temporary spoil board, and in the actual material. Attach the actual material to the temporary spoil board, then machine the center point and dowel holes into side one. 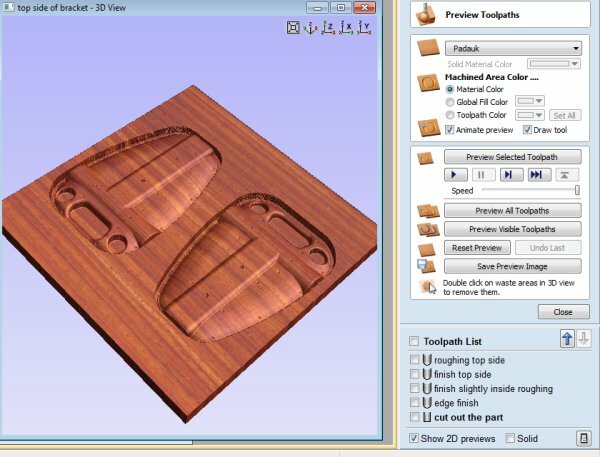 For the Desktop tools, try 3 and 1 ips for roughing pass and 4 and 4 for finish pass. 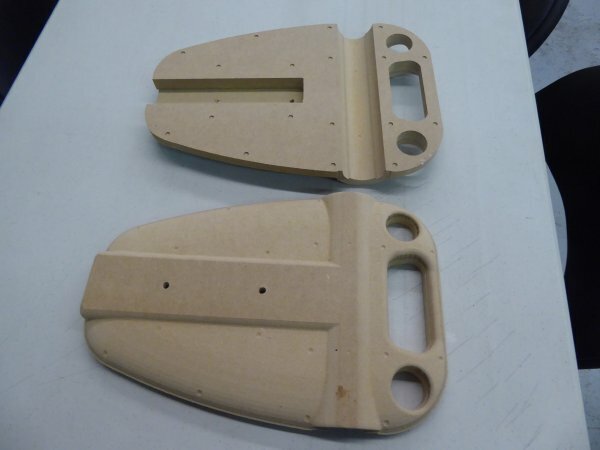 The parts were machined on a Buddy (32″ x 24″ cutting area. 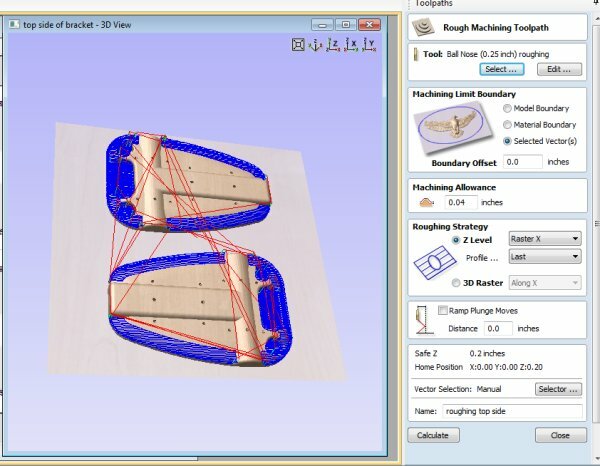 Completed samples viewed from the inside and the outside of the seat bracket. 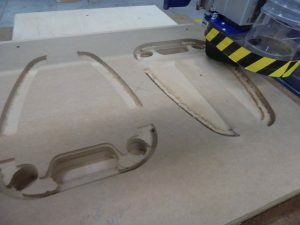 The two sides fitted together. *What Would I Do Differently? 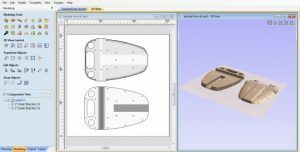 Design time: It would have cut down on my design time if I had asked the customer to send the vectors that made up the original 3D model (.eps or .dxf format) in addition to the 3D model itself (.stl format. ) 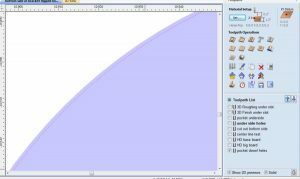 As it was, I had to use the tool in the Vectric software to define the edge of the component, or redraw the vectors I needed over the 3D component. 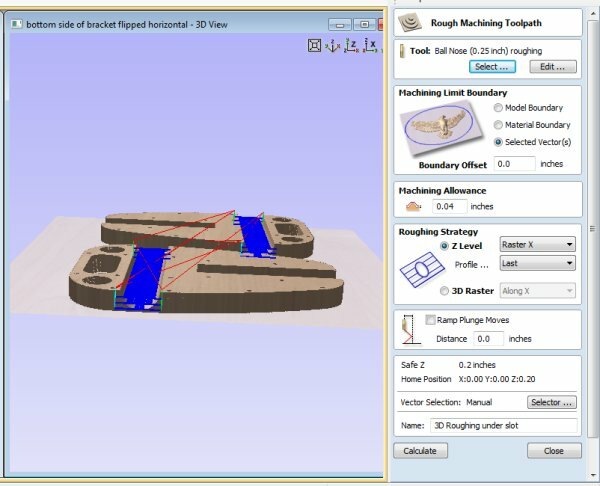 In Inventor, one can choose to view the model from above, then hover the cursor above the 3D rendering. 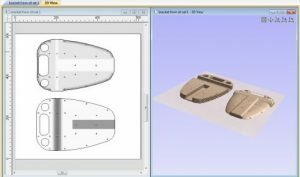 When the vectors are visible, right click to see the option to save as or export the vectors in .dxf format. Toolpathing options: I would think through more carefully how deep to make the tool paths that go along the edges of the model. 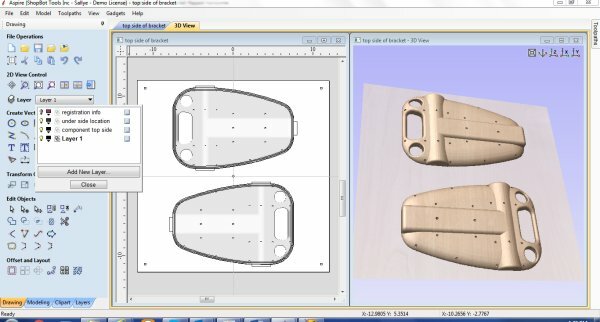 If I had made the 2D cut out on the first side I machined shallower (the “Inside”), then I would not have had to create two separate 3D finish passes near the edges of the second side (the “Outside”.) I would still put hold down screws in the center of the “Outside” pieces so that the work did not shift when I ran the final profile to cut out the samples. If the automatic XY Zero routine using the proximity switches has not been set up on the ShopBot, now is a good time to do that. In the ShopBot Control software, click on Tools>ShopBot setup. Click through the screens to find the page that talks about setting up the XY Zero routine. Choose “Make it easy on me”. The program will let you use the keypad control to move the bit to where you want 0,0 to be and zero it there. 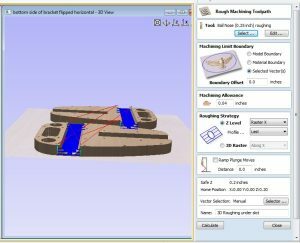 (Click on the fixed distance button on the keypad to fine tune movements of the ShopBot.) Then, the program will test the distance between the 0,0 point and the proximity switches, and make it so you only have to use C3 or the icon on the position screen to zero the X and Y. This is critical if you need the 0,0 to be absolutely accurate. By using the automatic X,Y Zero routine to give you a good starting point, then moving the bit to an exact location (M2, 12, 12) and setting the new zero there, you can always get back to that point in case of power failure or operator stupidity. I usually charge between $75 and $125/hour for design time and machine time (setup and clean up are also added to the actual machine time). Additional time added for set up, bit changes, clean up, etc. 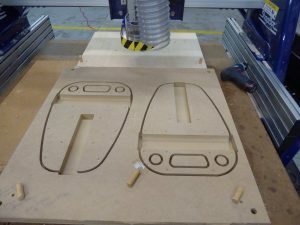 : approximately 1.5 hour, including surfacing the ShopBot Buddy table prior to machining the parts.